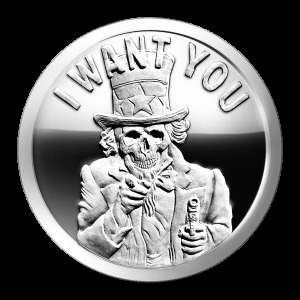 2 oz 2014 Warbird Silver Proof-like Round This release is a resizing of the very popular fifth coin design by Silver Bullet Silver Shield, challenging the design of the American Silver Eagle coin. 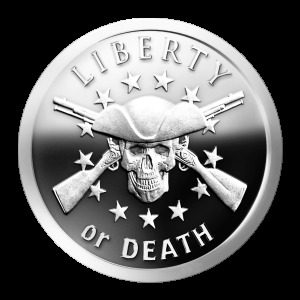 Here is what the coin author Chris Duane had to say about the coin design and meaning: "The all-seeing eye is a long used symbol of the elite to spread the idea that they are all-seeing and therefore all-powerful. The truth is that they are weak parasites that need us to sacrifice ourselves to them, because they are incapable of producing any real value. The all-seeing eye is used on our dollar bill and even DARPA's Total Informational Awareness program that is the father of the Prism Scandal that Ed Snowden exposed. This symbol is the power and enabler of the elite's conspiracy of Full Spectrum Dominance. We no longer need to fear them looking down at us. They need to fear us looking up at them and walking away from the bottom of their pyramid that we hold up. In the Warbird, the Bald Eagle was replaced by another predator, the aptly named Predator Drone. Like Ben Franklin's opposition to the Bald Eagle being the symbol of our nation, the Predator Drone is a symbol of everything that is wrong with America today. We have become further detached from the reality of our actions to the point we don't even need to send men to nations that oppose our Debt and Death way of life. The feathers of the Warbird are represented by the absolutely incredible, blood splatter, sculpting that the famed Sculptress Heidi Wastweet created. 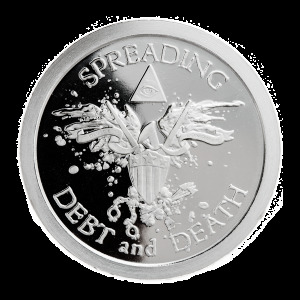 No other coin that I know of has used a splatter technique in sculpting a coin. This stunning representation of the real blood that is spilled by the Debt and Death Empire is even marked by her initials HW to the left of the Shield. The Shield represents the patriotic propaganda this Debt and Death Empire hides behind. 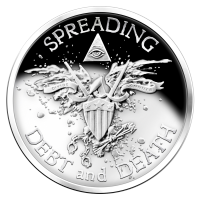 People must believe they are doing good and are given stories to use in their head to justify their active or passive participation in this Debt an Death Empire. This propaganda is mostly focused on those that make the system function. It assuages any tinges of guilt they may have with rationalizations. When that does not work, you can simply pop a pill to make the cognitive dissonance depression go away. 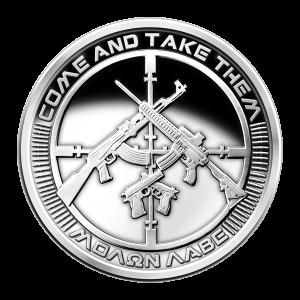 The banner Divide and Conquer replaces E Plurbis Unum of the American Silver Eagle. While we are told that we are a nation built out of many into one, the reality is the real power is created in dividing and conquering people. This is the same old playbook that has been used by the elite for centuries to divide and conquer people that goes back to Diocletian. We have far more in common with the average Iraqi than any of the psychopathic financial or political leaders we sacrifice and kill for. Below the Shield, is the true goal of our empire spreading the chains of debt to the willing and the arrows of death to the unwilling.